The relationship that Gov. Jindal has with the oil & gas industry has been further illuminated this week. Not only has he been successful in removing supporters of the lawsuit from SLFPA-E leadership, but has now prevented levee boards from suing anyone in the future. The new law that cuts out SLFPA-E, SB469, retroactively delegitimizes the levee board lawsuit and only allows certain government agencies from filing suit for coastal issues in the future. Thats right- levee board authorities, which are mainly comprised of lawyers and judges, can no longer undertake legal action to protect the coast line. Instead they are at the whims of state politics and the businesses closest to those in power. There has been a some grassroots mobilization against the lawsuit-killing legislation. Notably, LTG Russell Honore, a man who came into the public eye when commanding the Joint Task Force for Katrina, has now become a leader in Louisiana environmental issues. He and his group, Green Army, has been a consistent local voice in challenging corporate power in issues ranging from fracking to the Bayou Corne sinkhole. The General has proven to be an effective community organizer, in many ways becoming the default face of Louisiana’s marginalized green movement. But despite the state’s loyalty to the oil & gas block, there have been critics from within government. SB469 won by a 59-39(6 absent) in the state House and 25-11 (3 absent) in the state Senate. A sizable majority for sure, however, there still shows at least some political opposition to the booming industry. The most notable public official to speak out against the bill is Attorney General Buddy Caldwell. Caldwell is a conservative politician who has shown little interest in climate change or other environmental preservation issues. However, he has rightly pointed out that this law could prevent citizens from making claims from the BP oil spill. AG Caldwell, the seemingly lone public servant on the other side of this issue, has been drawing attention to this plausible scenario. ‘Plausible’ is probably the right word to use in this instance since a blocking citizens from compensation could lead to electoral backlash. Almost all Gulf Coast small businesses and home owners are reliant on the class action suits to receive BP money, having little input in the negotiation process. The state house restricting levee boards is a highly technical issue which could explain the lack of public concern on this new development. Critics mainly belong Greater New Orleans grassroots advocates, and as mentioned their voices are often muzzled by the powers at be. This issue is surely to arise again as Louisiana continues to a football stadium of coastline every hour despite Jindal’s approach of addressing the issue within the statehouse. Coastline destruction is an undeniably significant problem, that even the business community is anxious about. But the lack of electoral attention to this issue is particularly depressing for climate advocates. If states lack the political will to hold oil companies responsible for the destruction of land – then the prospect of holding said companies accountable for carbon emissions seems to be even more of a pipe dream. A significant legal battle in Southern Louisiana has led to a discussion on the evolving relationship between the public and the fossil fuel industry. The Southeast Louisiana Flood Protection Authority-East (SLFPA-E), a local authority that monitors levee structures around Greater New Orleans, has filed a lawsuit against the numerous energy companies that drill offshore. SLFPA-E uses compelling data that indicates that the exploration and drilling of fossil fuels has severely damaged the state’s wetlands and coastline. Not only does this have ecological impacts, but a compromised coastline makes residents far more vulnerable to storm surges and flooding. Research conducted by public officials as well as energy industry scientists has definitively outlined that oil & gas companies are responsible for roughly one-third of coastal erosion. Naturally, the accused companies strongly disagree with the validity of the suit. One Chevron executive referred to the lawsuit as ‘laughable’, and industry spokesmen displayed confidence that the state government would not let the charges remain. Sure enough, Gov. Jindal removed Jon Barry, head of SLFPA-E, roughly 2 weeks after the story broke and has since made moves to ensure that the suit fall flat. It’s not hard to see how close the oil industry is with Louisiana politics as well as daily life. Just about every New Orleans convention or event is sponsored by Chevron, that includes Super Bowls, Alligator Festivals and King Cake competitions. It’s not only American companies either- Sasol, a South African multinational, has recently committed to investing up to $21 billion in Southwestern Louisiana. The benefits of having energy producers in your backyard are fairly obvious. It has been well-documented how folks with high-school diplomas are making close to six figures working on oil-rigs. However, the SLFPA-E lawsuit proves oil & gas extraction has negative impacts that are too overwhelming to ignore. Lets be clear, the fossil fuel industry is here to stay in the Gulf. Uprooting oil & gas companies is just about unthinkable in the American South’s political climate. The industry is deeply ingrained within the Gulf economy providing over 50,000 direct jobs. After all, the majority of Louisianans were bitterly against the moratorium on oil exploration and drilling after the Deep Horizon oil spill. Lafourche Parish is known for having some of the lowest unemployment levels in the country, but during the moratorium the vast majority of constituents were left temporarily jobless. So unfortunately for climate change advocates, the debate concerning the future of fossil fuels is considerably narrower in Louisiana. However, this SFLPA-E lawsuit may finally be the politically safe platform that Louisianans have lacked in the past to rethink their intense loyalty to the energy sector- even if only in an incremental manner. While the lawsuit doesn’t bring any new concepts into the fold- oil companies’ ecological damage has been an issue for some time – it does have the benefit of timing. Coastal America was faced with enormous premium increases after a restructuring of the National Flood Insurance Program. The NFIP being the federal agency that insures homeowners for water damage from storms. After the Hurricanes Katrina, Sandy and Isaac the National Flood Insurance Program fell into $24 billion of debt. Despite recent reforms to the NFIP, Louisiana residents are still at risk of home damage which means that actuaries would increase their NFIP premiums. Being battered by storms has always been part of the Bayou state experience. 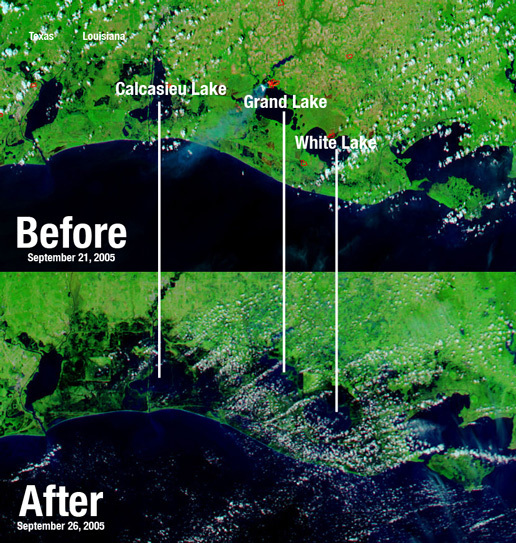 But the threat of property destruction is exponentially greater when the coastline buffer receding at such a fast rate. In fact, one of the primary reasons private insurers pulled out of the Flood Insurance market was because of coastal erosion. As proven by the aftermath of Katrina, insurance companies would be on the hook for tens of billions of dollars in claims, which would surely negate any revenue generated from monthly premiums. It is without a doubt Louisianans have a strong financial incentive to support coastal restoration efforts. Even conservative leaders such as Gov. Jindal (who is hardly an environmentalist) uses millions of state dollars to rebuild artificial sand dunes across the inner Gulf. Now the main questions are: how expansive should coastal restoration operations be? And who pays for it? 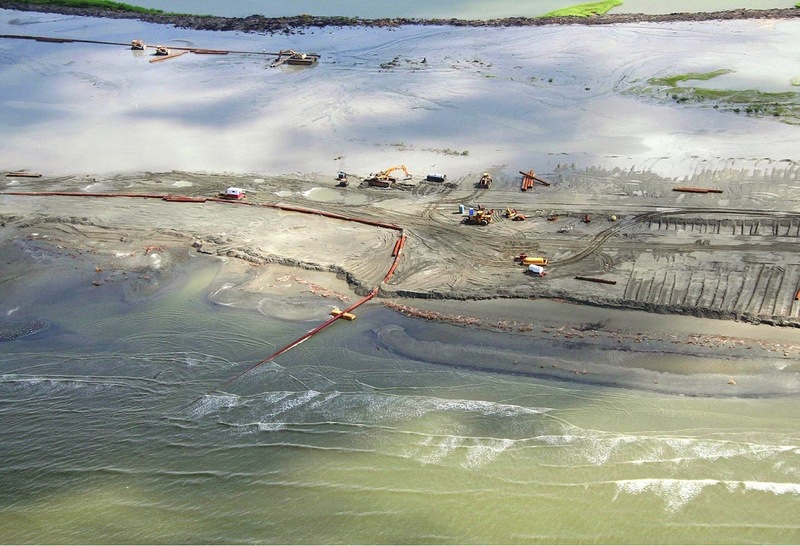 Unfortunately for the Louisiana treasury, state leaders aren’t ready to ask the energy companies to finance costly coastal restoration operations, even though they have proven to cause roughly a third of the damage. The billions of tax dollars collected from oil & gas companies help pay for Jindal’s coastal restoration efforts. But their current contribution barely puts a dent of the coastal destruction they have committed. The SFLAP-E lawsuit, while sure to fail, could potentially get Louisianans to demand at least some compensation for coastline damage outside of the tax dollars generated from their day-to-day operations. Obviously there will always be strong opposition to any move that demands additional accountability from oil companies- but the argument that these corporations will leave the Gulf if compensation is requested should be viewed with intense skepticism. Conservatives will always insist that taxes and regulation scare away business….And in an increasingly global marketplace, this argument has validity. But when it comes to extracting fossil fuels, don’t governments have considerably more leverage? To give an extreme example, when Hugo Chavez created ‘one of the most aggressive tax systems’, by increasing oil royalties from 1% to 16.6%, oil multinationals became incensed. Yet American multinationals continue operations in Venezuela to this day despite their cries of unfairness. No one in the US is asking for the level of compensation that Chavez demanded… yet the same sound bytes are used: ‘They don’t have to be here’. ‘They’ll go to China.’ ‘They’ll go somewhere more business-friendly’. Energy spokes people have continuously said, ‘Our shale is no different than elsewhere’. The concept of corporate-flight is a concern that routinely enters the debate whenever increased taxes or regulation is proposed, usually by those connected to the industry in question. The US and especially the Gulf have an enormous amount of shale formation along with a trained workforce. Plus unlike several countries that are major sources of energy, the US can guarantee a level of stability and safety for their workers. The truth is, it is fairly rare for a oil & gas corporation to cancel a drilling operations because of increased taxes- Which is arguably what the SFLAP-E lawsuit demands from oil companies to help restore Louisiana coastline. Exxon Mobil has been aggressively extracting oil in Angola where they are taxed at a rate of 75%. Of course, they only actually pay a tax rate around 35% after the US government reimburses the difference. The massive tax breaks given to US oil companies has been a contemptuous issue for the American left for decades now and has even gained some steam in the Tea Party movement as well. These beginnings of bipartisan support are easy to understand when you recognize that American taxpayers are subsidizing the choice of Exxon Mobil to work within an unforgiving business climate. This corporate favoritism should be seen as even more egregious considering that it has proven to be borderline political suicide to hold fossil fuel companies accountable for coastline destruction back in the US. Ultimately, the fossil fuel industry appears to be willing to put up with a lot of hassles when the payout is worth it. The risk-reward concept is hardly a groundbreaking economics, but is worth noting when you consider the vast resources the Gulf has in the form of shale gas. The Gulf stands in contrast to Kansas where Shell pulled out all operations in 2011 because of a unsatisfactory payout. Kansas played by the rules of the energy industry by hosting an almost nonexistent regulatory environment for horizontal fracking and some of the lowest tax rates in the country. Yet Shell decided that their shale deposits weren’t worth it even after buying 600,000 acres of land. Which brings me back to my main point: when you have the goods, the energy companies come to you. So shouldn’t we expect our government to maximize their leverage? Unfortunately, for people in Louisiana who face sky high Flood Insurance premiums and an unusually high level of poverty- Republican leadership isn’t even close to interested in asking a little bit more from these oil titans. GOP leadership has recently begun testing the line that the role of government is to facilitate a business friendly environment. But even conservative voters should realize that government should facilitate a strong business climate while getting as much as possible for their constituents. Doesn’t the Shell-Kansas story indicate that it doesn’t matter how comfortable you make oil companies? These folks will set up camp in war-torn, tax gouging, corrupt capitols like Angola. The broader issue of climate change is not a part of this coastal erosion discussion. Unfortunately, asking oil companies to curb emissions isn’t in the sphere of debate in Southern Louisiana politics. What is a manageable first-step is getting the oil & gas dependent states to start holding these energy corporations accountable for their most basic environmental degradation. Even though the SFLPA-E lawsuit has proven to be a non-starter, it provides a great opportunity for this first-step.